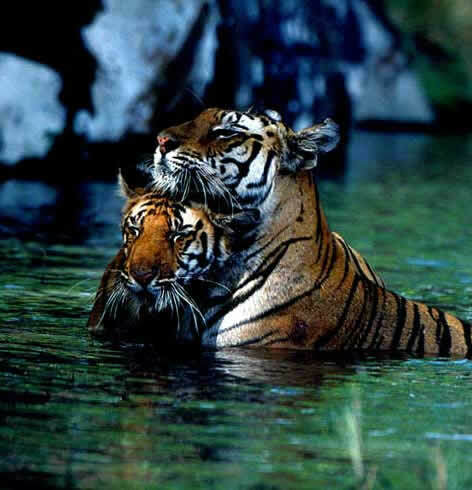 My life's mission, religion, passion and all the work that I do is associated with wild tigers, even my home is around tiger habitat and my companions are animals that live in tiger country, in short my profession is Tiger conservation. I was born in a small Indian village, education brought me to the big cities, always loved animals as well as the natural sciences and my first professional education began in a prime medical college at New Delhi , India . This formal education lasted only but two years as my passion & involvement for wildlife conservation soon took over. My first big job when I was in my twenties moved me to Kanha and then Bandhavgarh Tiger Reserves as a head of a conservation project funded by CIDA & implemented by WCWC, time flew and the project was completed in 1999. I needed monies to run conservation projects and luckily in late 1999 I was invited to the Netherlands by Artists for Nature Foundation (ANF International) to give a few field lectures on tiger conservation & their habitat on the occasion of their book release "Tigers". This resulted in my appointment as Director of ANF, India for tiger conservation. 11 years ago when I came to Bandhavgarh & Kanha passion forced me to observe tigers in their natural habitat and go into the forest. It was expensive. I needed funds to continue my work with local communities living around tiger reserves and tiger habitat conservation. I began guiding visitors into the parks and within two years I was thrilled to be guiding Discovery, BBC and their famous professionals into tiger country. Today, thanks to my exchanges with these professionals, well know conservationists, well wishers and the local villagers I act as a common point/catalyst in their interaction with tigers and the related conservation efforts. Being given the status of a NGI (Non Government Individual) of Bandhavgarh NP in the year 2000 has no doubt helped this process and I now spend most of my time in conserving the great cat and its habitat. Photographing the majestic and graceful Royal Bengal's has always been an obsession and I do hope some of my images will help create an impression amongst others so that they come forward and help protect these charismatic animals in their natural habitat. I would like to convey a very special thanks to all my guests, conservation professionals, photographers and film crew members that I have worked with. In these interactions I have been able to exchange views on tiger conservation with a global audience. All of them have helped me stay in touch with Tigers for the last eleven years and has helped me build my resolve to stay with them for the rest of my life. The opportunities I have had to witness wild tigers at close quarters have been a very humbling experience, this has lead to an unshakable resolve - I must continue to research, observe, photograph and help conserve the Royal Bengal. I promise to my experiences with you with same excitement, passion and commitment. On 4 th May, 2006 while photographing a mother and her four cubs I fell from an elephant and experienced my closest encounter with 5 tigers. For a photo essay on the encounter, click on 'encounters with tigers' at www.tigergallery.org.